Literacy takes center stage during Sycamore ES’ annual celebration of reading. Now in its fourth year, the Literacy Palooza event features a “book character” parade and other activities to promote the value of reading. The literacy focus affects student achievement beyond the language arts curriculum. Children who read at or above grade level are better prepared to understand and master content in other areas of instruction. The day started with a special presentation in the gym where students took a “Reader’s Oath” and special recognition for student readers. The school also kicked off a reading incentive program that will feature book reviews on the morning news and prizes for meeting reading goals. Based on student interest, each class selected a special book and the children dressed to reflect favorite characters in their chosen book. 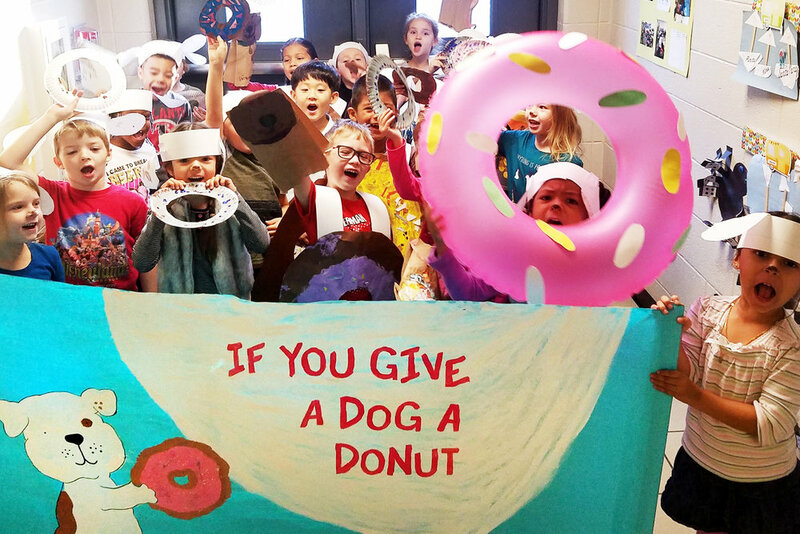 From 2nd graders dressed as the treat-loving moose in “If You Give a Moose a Muffin” to 4th graders taking a turn as one of the many canines in “The 101 Dalmatians,” the children displayed their love of childhood literary favorites in the Parade of Characters. New this year, the school district’s Book Mobile made an appearance. The specially outfitted school bus brings library books to children in underserved neighborhoods during the summer, but during the school year, local schools can “book the bus” for special literacy events like this one.